The Progressive Art Group in India formed after independence was initiated by 6 painters including SH Raza, MF Hussain and others. 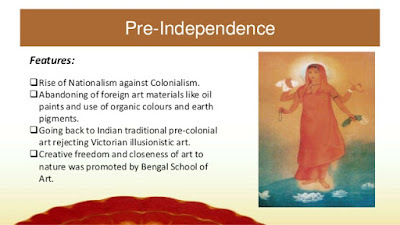 They are best known for combining Indian subject matter with new artistic techniques such as post impressionism, cubism etc. a) The concept of Progressivism emerges from the Age of Enlightenment in Europe which placed importance on industry, science, social organization, economic development as critical to human existence. The Progressives took a Marxist, anti imperialist world view and sought to relate art to the common lives of the people. Bengal school on the other hand sought to demonstrate the spiritual capital of the East and romanticized the idea of independence.